YOUTH HELPING YOUTH - Foundations heading to it's 10th Anniversary! Foundations Youth Centre MADOC 76 Durham Street, is getting a facelift thanks to our new landlords, deputy reeve Tom Simpson, Teacher Brad Olson and his construction class and professional volunteers who are also helping!! God bless all of you! AND MUCH thanks to the KIWANIS who have generously allowed us to use the Kiwanis Kitchen for our Lunch Program! Watch for the dates of the grand re opening and blessing of the new foundations! Foundations Youth Centre Trenton is moved to 50 Elgin Street on the second floor! Great location! Check our link to the Trenton site for times and events! FOUNDTIONS YOUTH CORP! Finally a way to connect all our locations! The foundations youth corp gives youth an opportunity to connect spiritually and prayerfully with all of us! The FYC want to follow Jesus in the "peaceful" way of St. Francis of Assisi by living the Prayer of St. Francis and wearing the armour of God every day! A great way to find "peace" in yourself and think about others!! To find out how you can join check out the website and contact fyc@thehavens.ca! Foundations Youth Centre in TWEED needs more volunteers!! We want to be open on Friday nights can you help? We're so glad you dropped in. If we all do a 'little' a 'lot' is not much & we can make a difference for youth by providing places, one at a time, until every community has an accessible & safe place for youth. The SDF has a proven track record of success & is dedicated to helping Youth by making safe places for them. Once immediate needs are met, Foundations trained volunteers network with other community resources, to provide support & expertise where it is required. The San Damiano Foundation has always worked very closely with local Food Banks, Businesses, Schools, Law Enforcement Officers, Churches, Ontario Works & Social Service Agencies, Community Issues Committees, Municipal Councils & local Chambers of Commerce & many others. In efforts to assist local community relationships & develop social skills, Youth are encouraged & recognized as a resource to Church & Community. 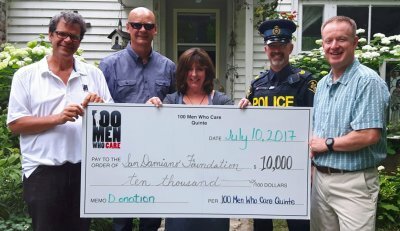 Colleen MacAlister from San Damiano Foundation (Centre) accepts a $10,000 donation from 100+ Men Who Care Quinte members Ken Manderville, Gary Buffett, Sgt. James Locke and Ian Press. Foundations offers a youth friendly “venue” to be “salt & light” to society. EXCITING ANNOUNCEMENT Foundations received a huge donation given for a specific purpose! Fr. Michael Tapajna, a strong supporter of Youth and a believer in the dreams and goals of Foundations made this possible!!!! This donation was given towards the purchase of St. Francis House as a permanent head quarters and training area for all Foundations volunteers!!! Thank you Father Michael!!!! 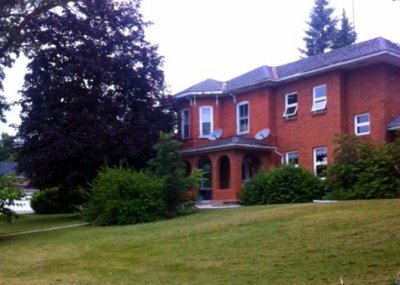 St. Francis House, has already been the home to many Youth Events and now it can develop even further. It is hoped that this property will also be developed into a "place" where youth from the different Foundation Communities can come together for special events and programs, such as "summer camps" at NO CHARGE!!! It is hoped that families will also consider coming together for outdoor campfires, sing alongs and family country craft days as well as quiet retreats!!!! All benefactors of the Foundations Youth Centres are welcome to come as well!! See full EMC article here.